Alia Marsha contributes in reporting. 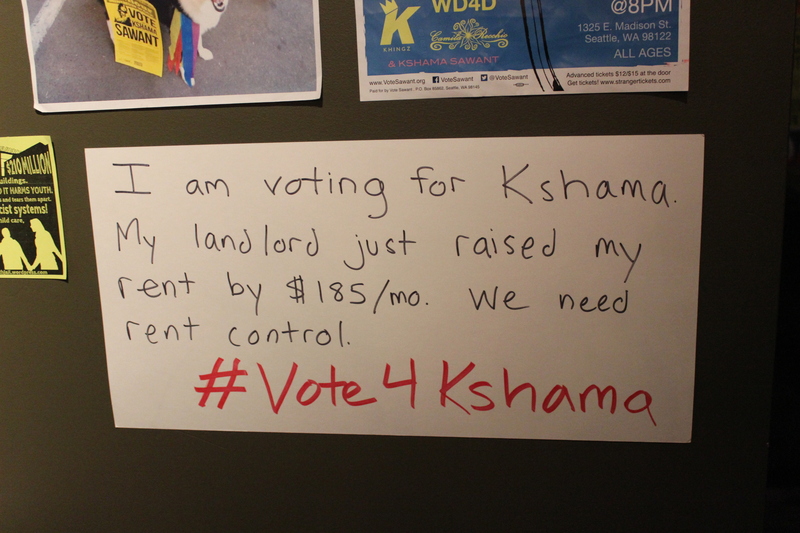 The crowd at Kshama Sawant’s election night party teemed with a contagious energy. There was an air of anticipation and excitement, blanketed by an over-riding sense of optimism and a shared clarity of vision. As people gathered over cold brews in front of a banner stating ‘a socialist world is possible’, the passion was evident. There was a communal sense that the entirety of Sawant’s city council bid was historic, revolutionary, and a step forward towards a better future. And those people were right to feel so empowered. What the Sawant campaign had achieved with so little against such stacked odds was extraordinary to say the least. The event was held at Melrose Market Studios, a cozy venue tucked away just south of Pine Street on Capitol Hill. Those in attendance varied, ranging from the die hard campaign staff and volunteers, to general supporters and members of the media. The walls were covered in the iconic $15/Hour Sawant campaign banners and socialist literature was fervently passed around. Slogans and rhetoric usually seen only in the context of on-the-street anti-capitalism demonstrations were displayed proudly in the fashion of an organized political enterprise. 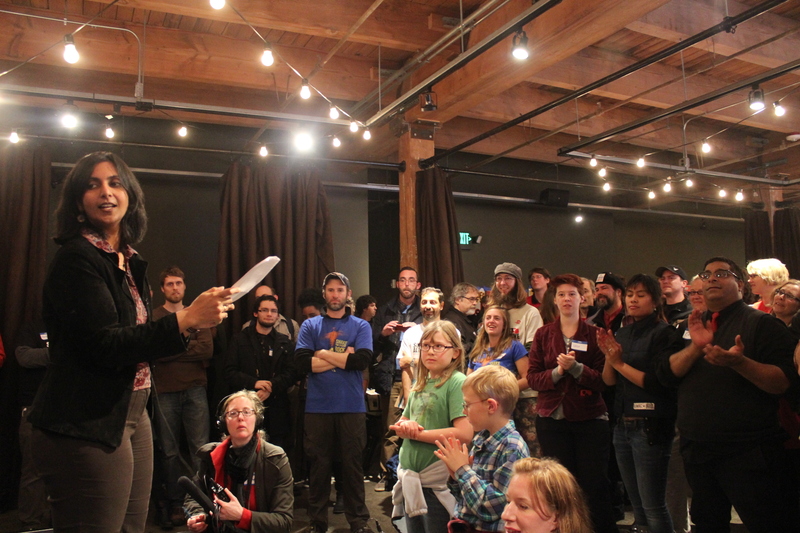 The Sawant campaign had brought the sentiment of the Occupy movement to the ballot box, and it meant to shake things up. After a giving people awhile to get settled, the party was kicked off by a few introductory speakers. 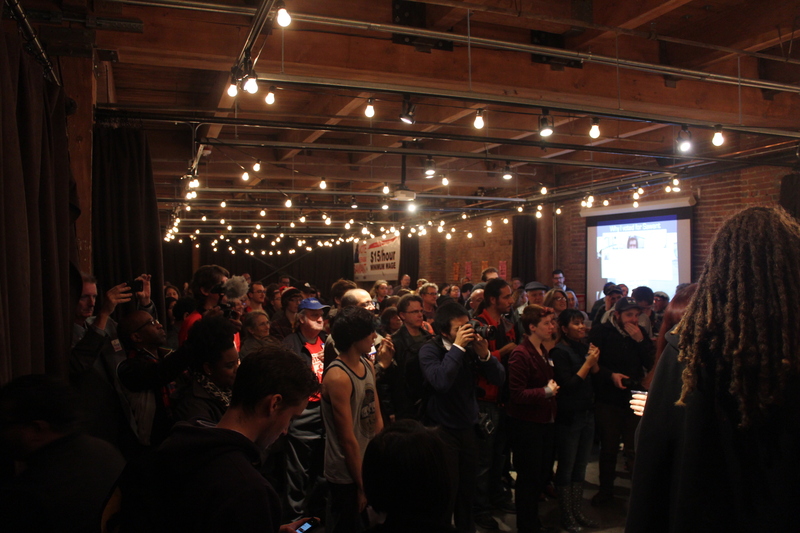 Jess Spear, a key organizer in the Sawant operation, gave a brief recount of the campaign’s achievements. She noted Sawant being the only candidate to be put on the ballot via petition rather than a financial buy-in, in addition to the national media coverage the campaign had received. The Sawant campaign rewrote the Seattle political rulebook on what it meant to be liberal and progressive, much to the dismay of the city establishment. One of the more comical highlights was an illustration of incumbent Richard Conlin’s flip-flopping on Sawant’s proposed wage hike, showcasing a statement he made at their first debate blatant dismissing the minimum wage increase, contrasting with the most recent debate at Seattle Central Community College where he claimed to have never made such a statement. He, like the city mayoral candidates McGinn and Murray, had adopted Sawant’s long standing call for a $15 an hour minimum wage only after the success of the fast food workers movement and the demand for higher wages had become apparent. We’ll see if newly elected Ed Murray will follow through on his in-the-moment campaign promises. Sawant then took to the stage to raucous applause and cheers. Her sincerity radiated throughout the room, as she proceeded to thank her staff, volunteers, and supporters for their effort and hard work. She stressed the fundamentally groundbreaking nature of the campaign, how it challenged the status-quo, was the only campaign to march in Pride in support of trans-gender equality, had Richard Conlin shitting his corporate owned khakis throughout the race, and voiced the sentiments of working class people who are fed up with the current two party system. All of this done through an entirely grassroots campaign which refused donations from corporations and raised a fraction of what Conlin pocketed from his buddies at the Hedreen Company and Seneca Group. “Regardless of the outcome, [the campaign] has been inspiring to everybody who wants to fight for social and economic justice,” Sawant said in an interview with New City Collegian. 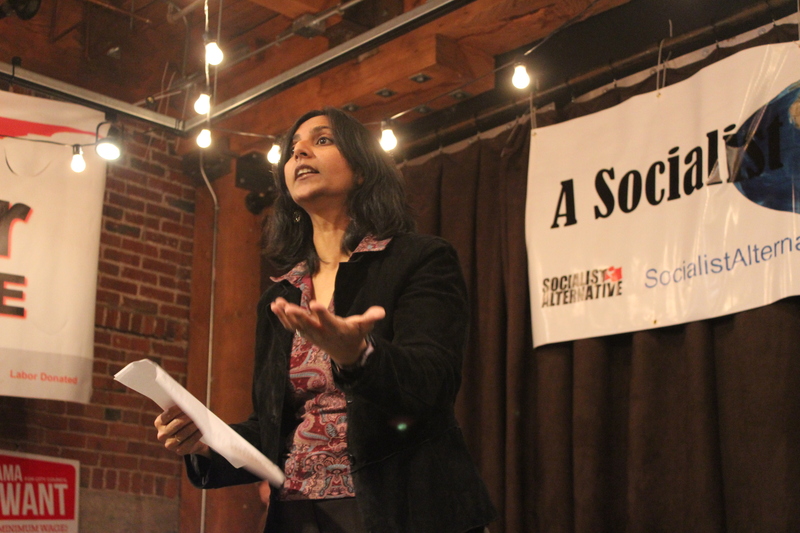 Sawant, a member of third-party Socialist Alternative, won 29% of the vote against Democratic WA State House Speaker Frank Chopp in 2012, the highest vote for a far-left candidate in decades. Given that context the ecstatic response to her 2013 results from her campaign and supporters was hardly surprising. Conlin went ahead and declared it a victory, as did the Seattle Times and most of the major city publications and news stations. Sawant didn’t concede, seeing as straggling ballots are still counted days after the election and the official winner isn’t certified until November 26th. There was hardly any sort of damper on the proceedings. The news of the success of neighboring SeaTac’s Proposition 1 to raise the minimum wage to $15 (coming in with a whopping 54% lead) was a cherry on top of an evening already going well. “It’s been an exciting journey. The question we should be asking is, when was the last time a campaign had generated this kind of excitement and energy,” Sawant said. As the lights dimmed and the music blared, the party ascended into merry whirl-storm of revelry and conversations of idealistic political and social change. Some may scoff at such idealism. Richard Conlin certainly did. And while he’s probably off somewhere smirking about how he ‘bested’ the activist economics professor from SCCC, he hasn’t removed the ideas and courage that Kshama planted in the city of Seattle. Yes, that idealism is somewhat akin to the feelings one experiences whilst starring into his or her bedsheets realizing the inter-connectedness of the universe on a head full of acid. But it’s exactly what is severely lacking in the mainstream conversations of America, and definitely what is urgently needed. The flood gates have been opened, and Seattle’s political debate reframed. May Kshama Sawant be the first of many such idealists to charge courageously into the daunting future in search of the light at the end of the tunnel. And hell if she manages to come out on top at the end of the last ballot count that would be mighty grand indeed. Follow reporter Josh Kelety and Managing Editor Alia Marsha on Twitter: @Josh_Kelety, @aliamarsha96.